Designer Barbara Hill applies her polished take on minimalism to a traditional 1920s abode in Atlanta for a transplanted Houston family. Two pieces from E15?s Shiraz sofa flank the company?s wooden Leila side tables. Hill chose to use flat paint in Benjamin Moore?s Decorators White throughout the home because it emphasizes the chalkiness of the plaster walls, making them ?look almost like slate.? The sconce shown in the foreground?David Chipperfield?s Corrubedo design for FontanaArte?gives off a soft glow and replaces the dozens of paper-lampshade wall fixtures the owners found in the house when they bought it. 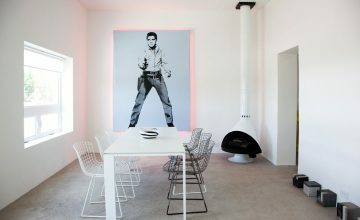 Stewart Cohen?s zany photograph of a gun-toting Marfa resident encapsulates Barbara Hill?s offbeat brand of decorating: bright and minimal, yet darkly humorous. To highlight the existing architecture of the home, Hill retained the dark polish of the casement windows, which she finds enhances period details instead of undermining them. 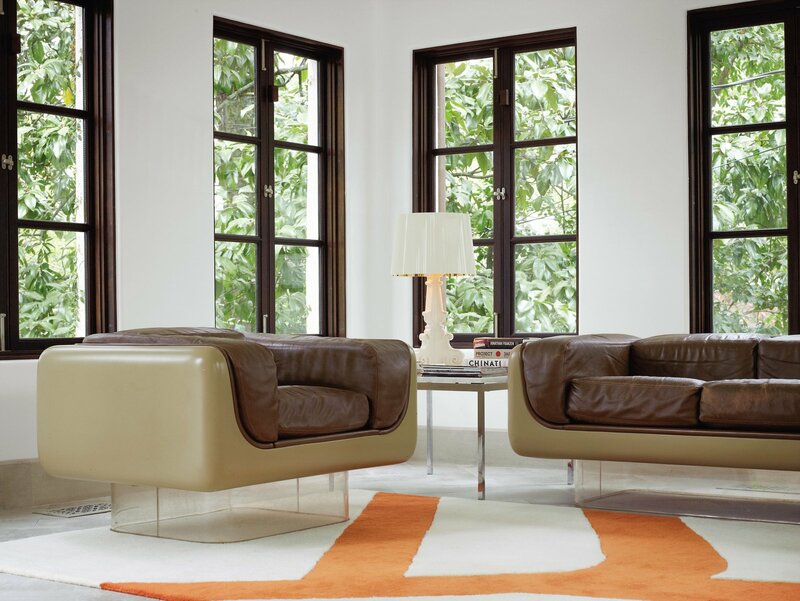 In the rear sunroom, the vintage Case Study furniture pieces with Plexiglas bases are from Metro Retro in Houston. A Bourgie lamp by Kartell is atop an old marble end table by Knoll, and the Gan kilim rug pictures a branch motif echoed in the kitchen and breakfast room. Hill had the overhead lighting in the kitchen customized by Rich Brilliant Willing in a pert orange that accents the primarily black-and-white interior scheme. She added a stainless steel kitchen island by Bulthaup, its glossiness and ?clean feel? tempered by the plastic stacking stools designed by Konstantin Grcic for Magis. The cabinets, appliances, countertops, and marble tile were kept as-is, with the addition of several coats of white paint in order to blend seamlessly with the walls. 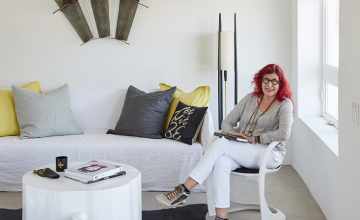 Houston-based designer Barbara Hill is known for a stripped-down aesthetic that blends art-world cachet with Texas modernism. Hill?s signature moves feature a heavy rotation of glass walls, open spaces, concrete floors, and the blue-chip minimalist art she helped introduce to the area back in the 1970s as an early champion of Sol LeWitt and Daniel Buren. 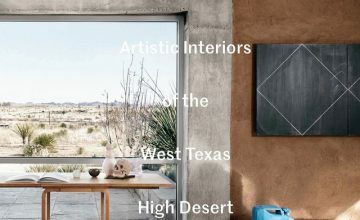 For her latest project, the venerated designer ventured out of Texas in the company of a family of four, whose contemporary Houston home she outfitted four years ago. 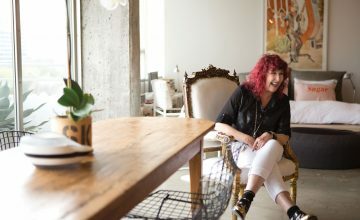 The owners, who relocated to Atlanta, Georgia, for work, wanted to re-create the feeling of their previous house with the furniture Hill had already selected and her unerring taste, which aligns so closely to their own that, say the homeowners, they ?never? disagree. After striking out on a search for an outwardly modern home in the genteel capital city, they changed tack and ranked their new neighborhood?formal, tree-lined, and gracious?as first priority, figuring they could make over the interior spaces with Hill?s assistance. The house they purchased is a Mediterranean-style two-story stucco structure that was chockablock with dark wood molding and floorboards, making Hill?s modern transformation even more remarkable. One of the first steps was to create a blank slate for the interiors by whitewashing the red oak floors, though it wasn?t as easy as she had hoped: ?We had such difficulty because the stain wanted to go pink! It took five coats.? To highlight the home?s existing shell, she left the inky almost-black of the arched walnut doorways and period iron stair railing, which she considers an ?assertive? contrast to the newly all-white walls, floors, and ceiling. Another effective brightening maneuver was leaving the windows bare. ?They?re not curtain people, I?m not curtain people,? Hill says with a laugh. ?The only drapes are in the master bedroom, and those were there when they bought the house.? She also ripped out the dark wood paneling that started in the front entry and climbed up the stair?a minor change that made a huge impact. As the owner reports, ?Barbara worked so fast it?s kind of shocking.? Lighting, too, has been addressed with fervor. 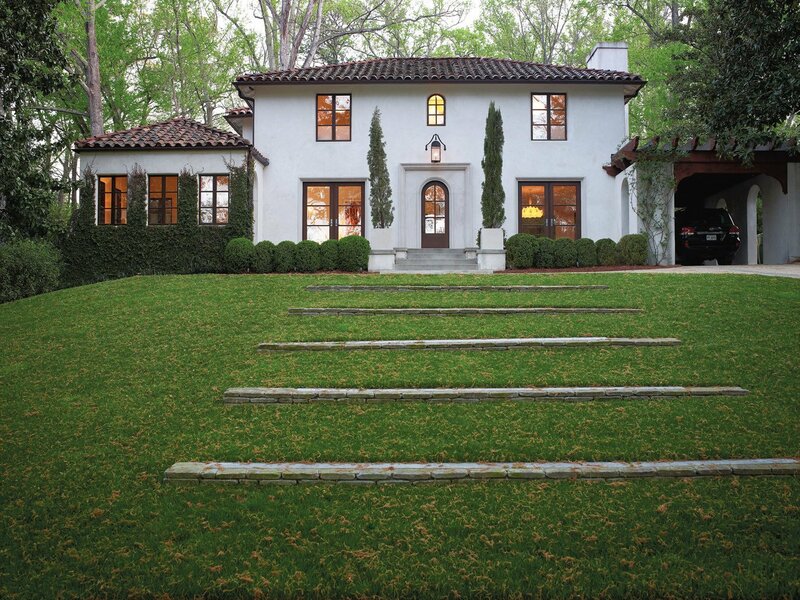 In contrast to the family?s home in Houston, possessed with ten-foot ceilings and a surfeit of natural light coming in through glass walls, the Atlanta abode requires some carefully composed illumination, from the minimalist sconces lining the walls that, says Hill, ?don?t call attention to themselves? to more show-stopping pieces like the custom-colored industrial pendant lights by Rich Brilliant Willing in the kitchen. Though the house may come across as pristine, the self-described ?messy? family doesn?t mind a scuff mark or two, especially in the case of their two rescued greyhounds, both 13 years old and ?total old ladies? who retired from a South Texas track. Other informal configurations tap into the family?s low-key sensibility: Two Tom Dixon Chippendale-inspired armchairs around a low coffee table replace a breakfast table in the kitchen, and the house?s parlor is now a cozy room for watching television. The entire space is a livable alternative to strict modernism; as Hill explains, the existing architecture?arched doorways, airy casement windows, and wooden doors?was worth keeping. ?Stripping down the ornamentation really sets those features off,? she says. ?Most traditional houses with good bones can do the same.? With the visual clutter gone, the house seems much more expansive than its modestly sized rooms would suggest, and the owners sing the praises of the charming neighborhood and their new-old house: ?People get hung up on the idea of modern as meaning one extreme thing, but nothing looks better than incorporating different eras.? Luckily, their designer couldn?t agree more. The home?s informal dining space has a slightly rustic feel, sporting bronze and wood in the form of a Lindsey Adams Adelman chandelier for Roll & Hill and a table by Terry Dwan, mixed with folk-art touches like the Eames House Birds and a cuckoo clock from Diamantini & Domeniconi. The PK8 chairs from Republic of Fritz Hansen were designed by Poul Kj?rlholm and sourced from Kuhl-Linscomb in Houston, Texas. Konstantin Grcic?s Venus chairs for ClassiCon surround a table by Poliform in the formal dining room. Hill selected the Flos chandelier designed by Marcel Wanders for its ?Old World reverence.? 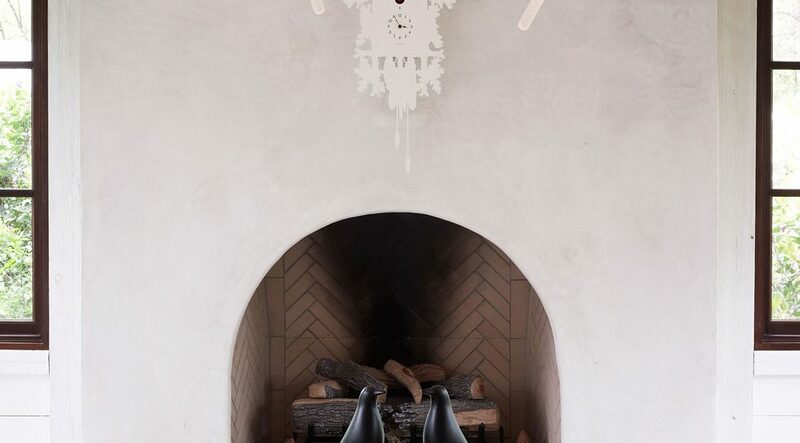 The sleek fireplace mantel was designed by Hill and cobbled together onsite from three solid slabs of limestone. The family?s 1920s Mediterranean-style manse is an eclectic example of the architecture found in Atlanta?s elegant Buckhead neighborhood. 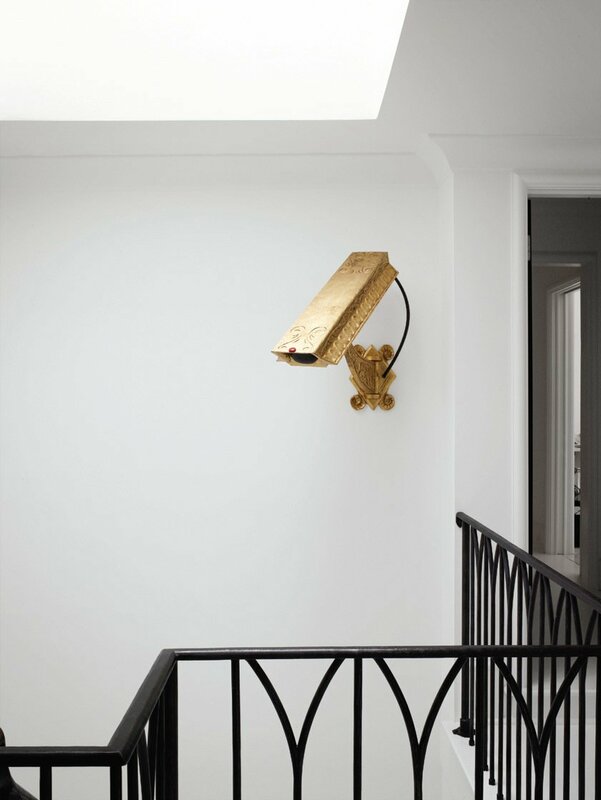 The gold (nonfunctioning) surveillance camera by artist Camp Bosworth in the stairwell previously hung in the glass entryway of the family?s former house in Houston. 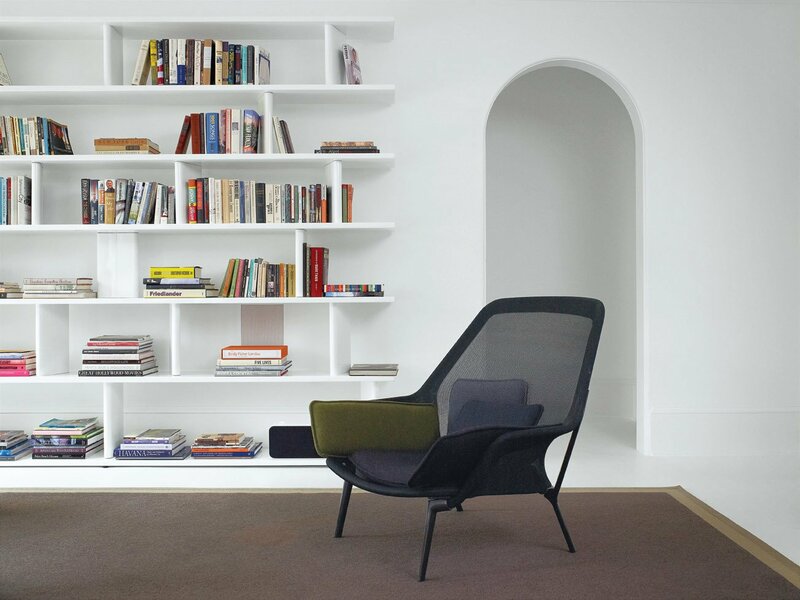 Vitra?s Slow chair sits in front of a powder-coated-steel bookcase made by Hill?s go-to fabricator, George Sacaris; it was originally built for the Houston house. 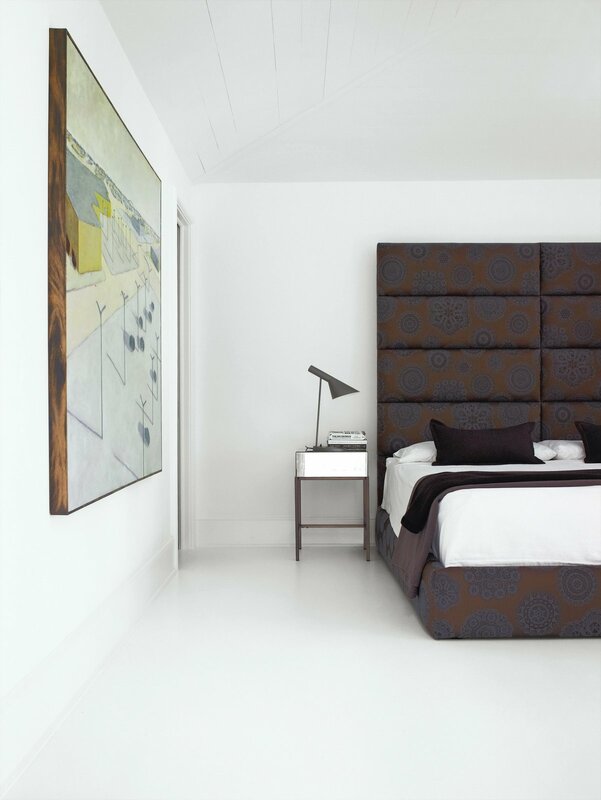 Intended for a much bigger room in the family?s previous home, the bed was designed by Hill and is covered in Maharam fabric in a doily print called Intricate 001 Charcoal. The side tables are from West Elm, and the AJ table lamp is by Arne Jacobsen for Louis Poulsen.